Italian Coordinate Measuring Machine manufacturer COORD3 has released its 2013 CMM model range offering improved measuring performances. 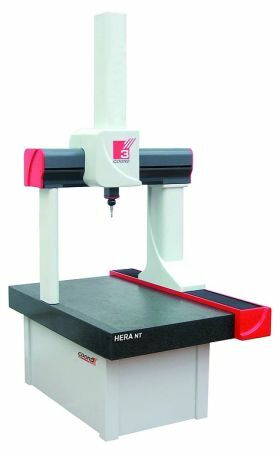 The 2013 CMM series offers the inclusion of the new PH10 PLUS series of motorized indexing probe heads, wireless thermal compensation, high resolution free-floating measuring scales and a free Stylus Change Rack. The launch by COORD3 of the new series of Renishaw PH10 motorized indexing heads designated PH10 PLUS, provide a 20% improvement in repeatability (0.4um) over the original PH10 heads with increased long-term stability and reliability. Combined with an optional extended 3-year warranty, the new PH10 PLUS heads offer COORD3 CMM users a new standard of indexing head performance by providing reliable precision in even the most demanding measurement applications, including long reach applications such as those using the SP25M scanning probe. The PH10 PLUS head provides the ability for the stored data download as part of a head recalibration or service repair. The unique COORD3 Bluetooth wireless CMM thermal compensation allows the measuring system to automatically and dynamically compensate for thermal changes in the CMM and part without the use of cabling. Thermal compensation of a coordinate measuring machine's principle structural components, and the part being measured, are desirable to ensure measuring accuracy over an extended temperature range when the CMM is installed outside of a temperature-controlled room or enclosure. Typically a temperature compensation system comprises temperature sensors and cabling running through the machine back to the CMM controller. The more sensors the more accurate the solution, but these cables can cause CMM mechanical issues and will eventually fray or break due to the CMM's constant motion. The COORD3 wireless system allows the CMM to perform with stated measuring accuracy from 16 degrees to 26 degrees celsius, according to the company. In addition, the 2003 COORD3 CMM series utilizes 0.1um resolution measuring scales that are free-floating in support tracks, eliminating any CMM structural changes from influencing measuring scale accuracy. Traditionally, measuring scales are rigidly fixed to the CMM and hence move with the CMM structure introducing measuring errors.